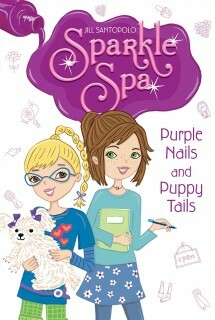 When Aly and Brooke decide to give PET-icures to puppies, it seems like their new Sparkle Spa salon might just go to the dogs! At Aly and Brooke’s new nail salon, anything goes. Well, almost anything. One of their mother’s regular clients doesn’t go anywhere without her beloved dog Sadie, who’s a canine star. One paw leads to another, and the girls not only polish Sadie’s nails, but also hatch a scheme to do doggy makeovers for the Annual Pup Adoption Day at the local shelter. But dogs aren’t exactly ideal customers, are they? The girls are finding out the ruff way!